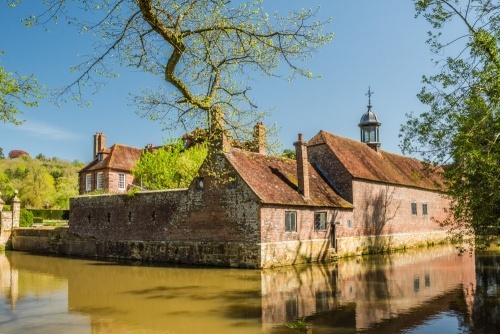 Peaceful 17th-century formal gardens surround a picturesque moated manor house at Groombridge Place, near Royal Tunbridge Wells. Groombridge boasts a knot garden, white rose garden, oriental garden, peacock garden, herbaceous borders, and a secret garden, laid out as separate garden rooms. The first written record of a manor house at Groombridge comes from 1239. William Russell built a moated fortified house here, with a later chantry chapel. The manor passed to the Cobham family, and then to the De Clintons, and at length to the Wallers of Lamberhurst. Sir Richard Waller fought at Agincourt in 1415 and took Charles, Duke of Orleans prisoner. He held the Duke at Groombridge for several years, before he was eventually moved to the Tower of London. 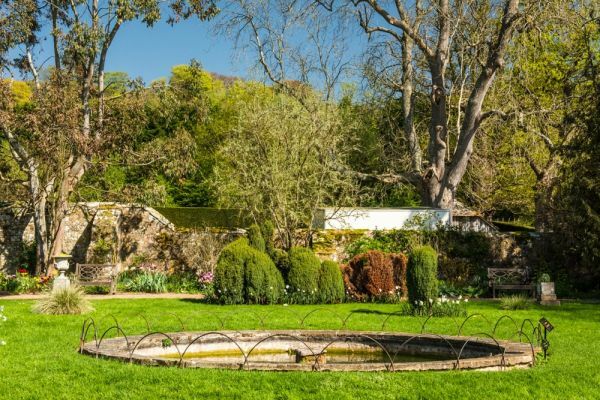 The Wallers sold Groombridge in 1604 to Sir Thomas Sackville, 1st Earl of Dorset. Unfortunately, the 3rd Earl gambled his family fortune away and had to sell Groombridge to pay off his debts. The buyer was John Packer, and it was his son Philip Packer who built the current manor in 1662. Packer was a friend of architect Sir Christopher Wren, and Wren helped design and build the new house. A later writer, Sir Arthur Conan Doyle, was a visitor to Groombridge and modelled 'Birlstone Manor' in his Sherlock Holmes mystery 'The Valley of Fear' after the house. 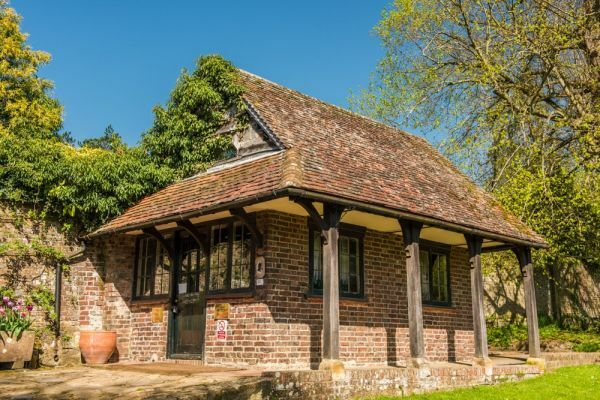 At the entrance to the formal gardens, you can visit the Conan Doyle Museum and Mini-Theatre, a tribute to the author and his connection to Groombridge. 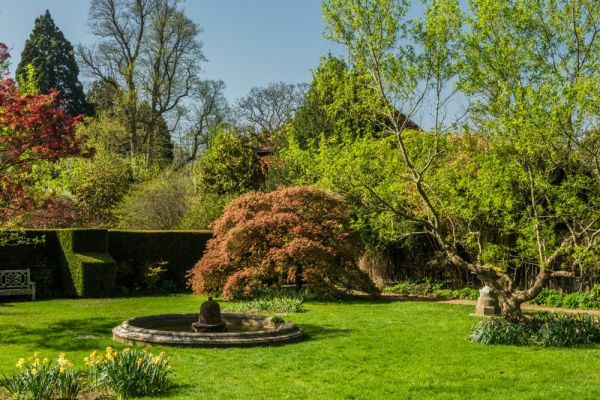 One of the most intriguing garden areas at Groombridge is the Secret Garden, with a stream running through a quiet, hedged enclave. Philip Packer passed away in the Secret Garden while reading a book. A bit of a historical mystery clings to this garden as well. The story goes that Richard Waller of Groombridge fell in love with Cecily Neville, wife of Richard Plantagenet and mother of Richard III. When Cecily died in 1495 she was buried in the nearby churchyard and Waller planted a hawthorn tree beside her grave. A piece of the 'love tree' is kept in a box on the wall of the Secret Garden. Unfortunately for this romantic story, it just can't be true, for the church had no burial ground in the 15th century, and Cecily Neville was buried at Fotheringhay in Northamptonshire. 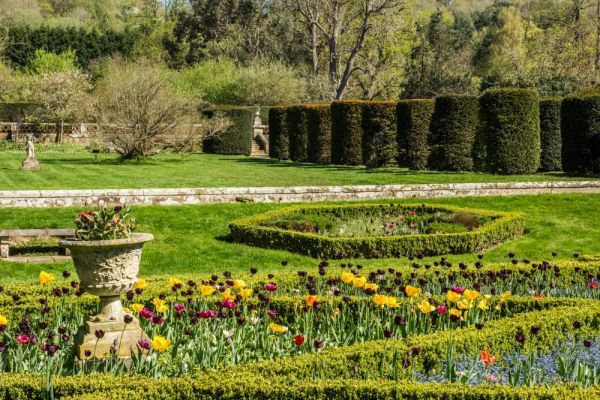 Major garden features include a knot garden with displays of tulips, and the Apostles Walk, bordered by 12 yew trees planted in 1674. 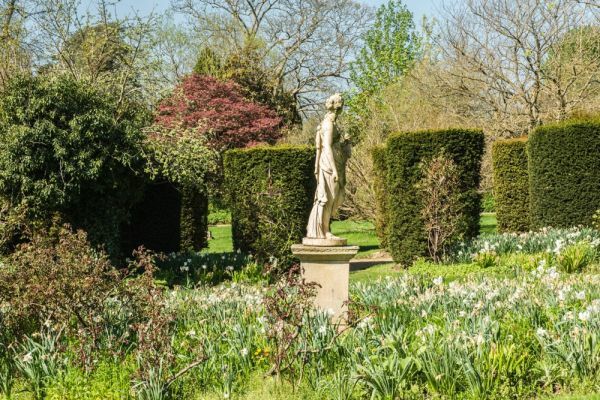 There is a herbaceous border with lush plantings of perennials, and Oriental garden with a theme of 'hot' colours, and the Draughtsman's Lawn, where spring bulbs flourish and ornamental shrubs and trees offer vibrant colour in summer and autumn. Other highlights include the Drunken Garden, one of Conan Doyle's favourites. 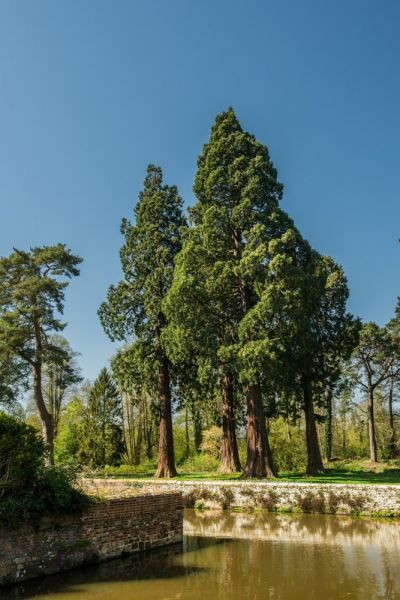 The garden features yew and conifer topiary shaped to give he impression they are emerging from the mist organically. Perennial flowers and grasses are planted around a clock fountain. The Knot Garden is rich with colourful tulips in spring and the white Rose Garden features over 20 varieties of roses underplanted with silver and white plants. A giant chessboard shelters under a yew tree planted by Sir Richard Waller in 1415 on his return from the Battle of Agincourt. 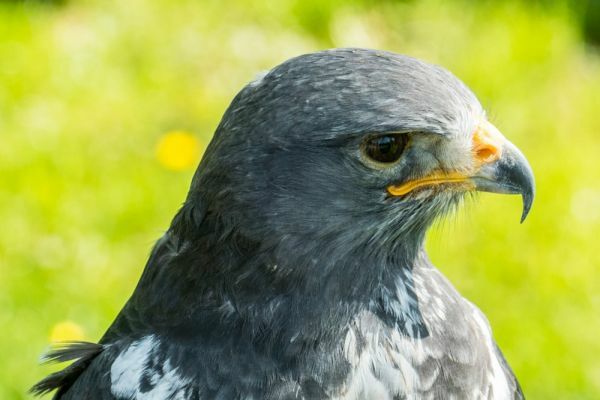 Aside from the gardens, there are a number of family attractions at Groombridge, including birds of prey, a zip wire, children's adventure playground, baby animals, and canal boat rides. 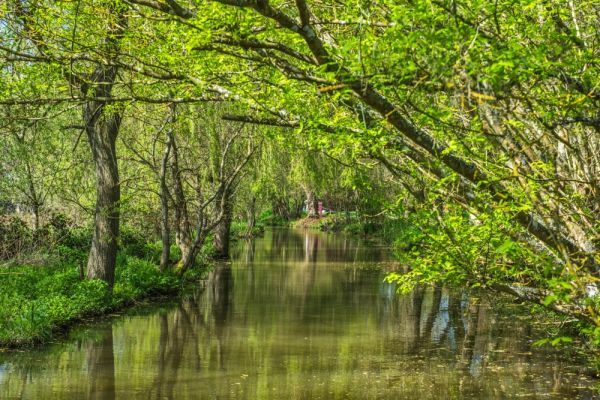 Most of these family features can be found in the Enchanted Forest, which can be reached by a canal boat trip or a shaded walk along a peaceful waterway. 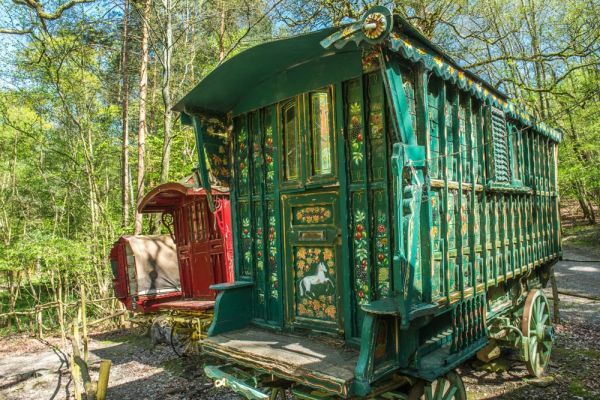 Also in the Enchanted Forest is a Romany Camp with traditionally colourful wagons.